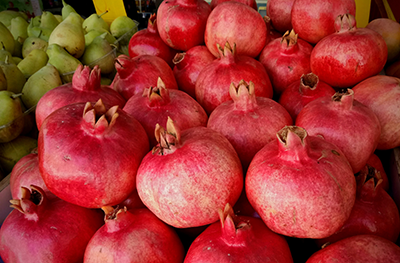 Pomegranates piled high in the Haifa shuk. Photo by Jessica Halfin. Haifa’s open-air market, or shuk, is a crossroads between modern-day necessity and the magical simplicity of eating local, fresh, seasonal produce. In Israel, fruit is eaten when it is meant to be eaten, at the peak of freshness. Want lemon in your soda? You may have to get by with limes if the former is not in season. And really, there is nothing like a juicy, sweet-as-candy mango in the late summer, or a perfectly ripe persimmon in the wintertime. That agricultural ethos is palpable in the shuk, in abundance, and a walk through its crowded alleys has me thinking about the harvest holiday of Sukkot, which begins the evening of October 4. Although it is traditional to eat foods that are stuffed on the Sukkot holiday, I like to take the celebration at face value. It is a harvest holiday, about celebrating the season’s bounty while dining in a sukkah under the starry sky. Come early fall—still late summer in Israel—pomegranates and citrus fruits stud the shuk stalls. The bulbous red pomegranates piled in large bins become a kind of display contest and source of pride among the vendors, who leave cut-up portions of the fruit for shoppers to nibble. Late fall is olive harvesting time in the nearby villages of the Galilee. Following the first rainfalls of the season, farmers collect the plump olives that have been accumulating on the trees for months. Some are saved for pickling, but most go to the town’s olive oil press to be transformed into dark green unfiltered olive oil. If there ever was an elixir of youth, this is it. The oil remains young and slightly bitter for the first six months. After, it becomes the oil of choice for anything and everything. Little bits of pulverized olives sink to the bottom of glass bottles, showcasing just how little processed this product is. My family opts for the giant 4.5-gallon yellow jerry can, and use it until we reach the dregs. Galilee oil has become a main component in my hearty and crunchy granola recipe, though you can use the best olive oil you can find. This is a versatile recipe that can be dressed up with the dried fruit and nuts you prefer. Eat the granola as a cereal or enjoy it with yogurt and fruit, as described here. Freeze whatever granola you won’t use in the immediate until needed. Makes about 12-13 cups. Whole wheat flour creates a crunchy finish that maintains its crunch over time, while adding a bonus nutty flavor. Dried fruits and nuts should be added while the granola is still warm—just after baking, not before. 1. Preheat oven to 350°. In a large bowl assemble all ingredients except for the dried fruit and nuts, lightly tossing after each addition. 2. Spread granola evenly on two large baking trays in a layer the thickness of one fingertip (you may need to make more batches depending on the size of your oven). Bake for 20-22 minutes, or until the granola takes on a deep brown hue. Periodically check during the last minutes of baking to prevent burning. 3. Remove from oven and top with chopped nuts and dried fruits. Doing so while the granola is warm allows the nuts to release their oils and get a light toasting. 4. Once cool enough to touch, break up the granola into crumbles with your fingers. Let cool completely on tray, then transfer to a large container or plastic bag for storage. Serves 1. Use whatever fruit is in season—here, I’m using in-season citrus from the Haifa shuk. 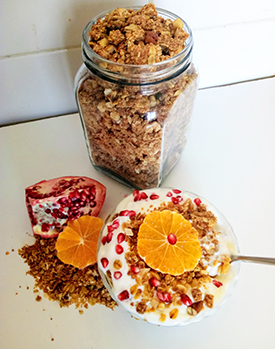 To keep the granola crunchy, assemble just before serving. Beginning and ending with yogurt, layer the parfait ingredients one after another, repeating the process until you reach the top of the bowl or glass. Garnish with a sprinkling of granola and extra fruit on top.